"Total Hours", both of which released around the same time last year. Just Dance 2 has had about 261,918 Wii owners report their play-time data through the Nintendo Channel, since the game released on October 12, 2010. The last report on Just Dance 2 was from game-play data recorded on November 22, 2010. 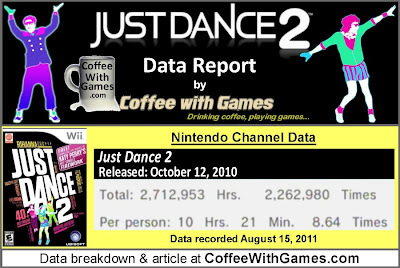 At that time, Just Dance 2 had game-play hours debut on the Nintendo Channel from approximately 10,067 Wii owners reporting data. Just Dance 2 has seen an increase of 251,851 Wii owners reporting data through the Nintendo Channel. This means about 5% of Just Dance 2 owners in the United States use the Nintendo Channel to report their play-time data. Just Dance 2 now has 2,712,953 Total Hours of game-play reported, which is an increase of 2,653,436 Total Hours since its debut data from November 22, 2010. Just Dance 2's total average hours played is now 10 Hours 21 Minutes "Per person"(or console) reporting data, an increase of 4 Hours 27 Minutes above the game's debut average. The average play-time per dance session now is just over 1 Hour 11 Minutes, which is about a 15 minute decrease from the initial average. This means that each day/time Just Dance 2 is being played, Wii owners are spending 1 Hour 11 Minutes dancing! Just Dance 2's Amazon.com sale rank is #9 and it is currently selling for $25.00 with free shipping, which is a 37% savings off its MSRP. Just Dance 2's "professional" review score average is 77.25%, based on 16 reviews on GameRankings.com. The game has a 4.5 out of 5 Stars rating on Amazon.com, based on 955 customer reviews. Just Dance 2's customer review score average is 90.45%, when the customer reviews are converted to a 100% review scale. Ubisoft just released Just Dance Summer Party on July 19, and Just Dance 3 will be releasing later this year on October 11, helping keep the Just Dance games series alive. I can see how the series has become successful with the marketing behind it, and the audience it has attracted. I'm not sure though, if the Just Dance series will become like the Tony Hawk or the Guitar Hero series where sales drastically vanish from one year to the next, but as Just Dance and Just Dance 2 have proven successful, I think Ubisoft will continue to support and market the series well in the future. The fact that Just Dance 2 has sold more than 5 million copies in less than a year I think is an incredible feat for a game, and one any developer would hope to accomplish. Though I haven't played any of the Just Dance games yet, one game from the series might become part of our Wii collection in the near future. Have any of you played the games in the Just Dance series, and if so, what games in the series have you played? If you have not played any of the Just Dance games, is it a series you are interested in? This game is the very best casual game I've played. Great music tracks (for dancing), routines that are fun, and a reasonably accurate control input; as you get better at the routines, your score does increase. While I haven't played any of the "Dance" type games, Mrs. Coffee and I own, and have played, the Rayman Raving Rabbids Wii games, that have the "music" mini-games in them, and we thoroughly enjoyed the simplistic idea behind them, and the competitiveness they offered. Kind of interesting about your co-worker with Dance Dance Revolution on the PS2, I own one of those games, and two of the dance pads for it...but they were rarely played. I know of Helix, and the WiiWare developer behind the game, as I have enjoyed one of their other WiiWare games a lot, that game is Rage of the Gladiator. As for Just Dance Kids, I have debated on that for our son, as he is two and knows some of the groups in it(The Wiggles), but I don't think he would do much other than flail the remote around...which for him would probably be a lot of fun though! Thank you all for the comments/feedback! I appreciate it, and hopefully others will find this post in the future and see your feedback on the game when making decisions about possibly purchasing one.